Malcolm Turnbull’s plan for tax cuts is dominating the political agenda. More and more detail showing how far the plan is loaded in favour of the rich has emerged. A Parliamentary Budget Office report prepared for The Greens showed that, once fully implemented, the tax cuts will cost $24 billion a year. Over 40 per cent of the benefits would go to people earning over $120,000. Although the government claims they are about reversing “bracket creep”, as the impact of inflation pushes people into tax brackets where they pay more, a Grattan Institute report has shown that the top 20 per cent of income earners would pay less of the overall tax collected. The changes are about delivering for the Liberals’ wealthy backers at the top end of town. This is what Turnbull means when he talks about, “giving every incentive to people to get ahead, to do some overtime, to seek a promotion, to start a business”. Labor has agreed to support only the tax cuts for low income earners that deliver a maximum of $530 per person a year. But it says it is considering the second stage, which cuts the tax rates on incomes between $37,000 and $41,000 and on those between $90,000 to $120,000. It is opposing outright the third stage of the plan, which delivers massive handouts to high income earners through raising the top tax threshold and imposing a flat tax so all those earning between $41,000 and $200,000 pay the same rate of tax. Turnbull is refusing to split up the measures and hopes to push Shorten into passing the whole package. But Labor needs to directly oppose Turnbull’s hand out for the rich. The government says it is delivering on the economy and jobs growth. But despite the best economic growth for six years, wages have stalled. Most workers are barely keeping up with inflation. The minimum wage, raised by just 60 cents an hour in June, is a poverty wage, while a new study found that half of 25-year-olds are unable to secure full-time work despite 60 per cent holding tertiary qualifications. A small consolation is that Turnbull’s obscene $80 billion in corporate tax cuts now won’t pass parliament. They have always been deeply unpopular. But Pauline Hanson has sniffed the wind and worked out that giving $17 billion in tax handouts to the four big banks—while scandal after scandal emerges through the Royal Commission—is politically toxic. The banks’ efforts to screw customers and boost profits and bonuses are being exposed daily. They have charged fees for doing nothing, charged fees to dead people and forged documents. AMP is facing criminal charges for lying to the regulator, ASIC. And the scandals don’t stop at the Royal Commission. The Commonwealth Bank has been issued a gigantic $700 million fine, the biggest in Australian corporate history, for systematic failures to report money laundering. ANZ, Citigroup and Deutsche Bank are up on criminal cartel charges for manipulating a share float. Political commentators claim the government’s electoral fortunes are recovering. But the latest Newspoll was back to 52 to 48 per cent in Labor’s favour. Essential poll had Labor up at 54 per cent. The five by-elections scheduled for 28 July will put this to the test. There is speculation that if the Liberals do well Turnbull might call a September or October election. The closer the election gets the more union leaders are arguing to go quiet for Labor, and not do anything that might risk its electoral chances. This was the argument the CFMEU’s John Setka used to justify shutting down debate over refugees at the Victorian Labor conference at the end of May. Turnbull’s government for corporate bosses and the rich has to go. But going quiet on Labor means there is less pressure on them to deliver a real break with the Liberals’ agenda. A Labor government will deliver some changes on the rules at work. 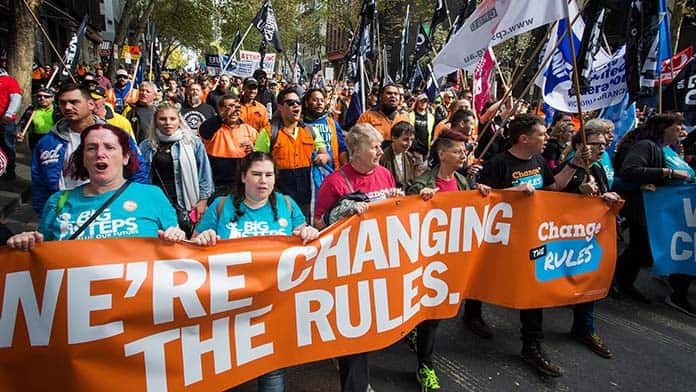 But they are resisting anything that would give unions greater power to demand pay rises and better conditions through scrapping anti-union laws and giving us the right to strike. The lack of strike action to fight for pay is a key factor behind wages stagnating. There were just 23 industrial disputes in the period from January to March, the lowest number since June 2006. Strike levels are near the lowest on record. We can’t leave it to Labor—or expect them to deliver without a fight.